There are one or two useful tools here, but 360 Total Security isn't accurate enough to be your sole antivirus app. 360 Total Security is a free security and PC maintenance suite from the Chinese developer Qihu 360 Software. The suite covers all the security basics, including antivirus with both the Bitdefender and Avira engines, anti-ransomware, and malicious website filtering. And it goes much, much further, with online shopping protection, webcam protection, keylogger blocking, a sandbox, built-in Wi-Fi security checks and automatic installation of security patches for Windows, Office, Java, Adobe Reader, Flash and other key apps. Bundled PC maintenance tools include a comprehensive hard drive clean-up module, and a speed-up feature which enables tweaking startup items, Windows services, scheduled tasks and some key network settings. If this doesn't quite match your needs, there are a couple of alternatives available. 360 Total Security Essentials is a stripped-back release which includes all the main antivirus and browsing protection features, but drops security patch detection, the Wi-Fi security check, clean-up and speed-up modules. The commercial 360 Premium Membership includes all 360 Total Security features, and adds a firewall, privacy cleaner, file shredder, disk analyzer, driver updater and more. There's no spam filter or backup tool, but otherwise it's a feature-packed suite which seems very reasonably priced at £17.99 ($22.50) for a one year, three PC subscription, dropping to £11.66 ($14.60) if you pay for three years upfront. Setting up 360 Total Security is easy. A small installer downloads and unpacks the main program files. We could do this even on systems with another antivirus installed, so you're unlikely to get demands to uninstall 'incompatible software'. There's no need to register or create an account, and once the installation is over, the main program is ready to go immediately – no reboot required. There are a few small complications. 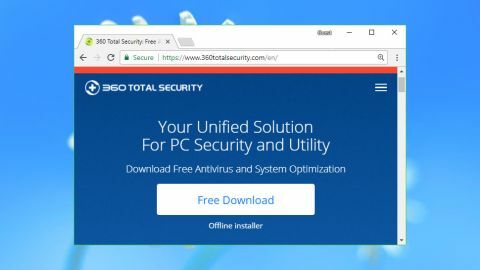 360 Total Security uses browser extensions to try and keep you safe online, for instance, but this isn't made clear and they're not installed automatically. There is a screen buried in the Settings dialog where (in theory) you can start an installation for Chrome, Firefox, Opera, Yandex or Edge, but even if you find this, it doesn't always work (the Chrome Install button did nothing for us). It's interesting to see how many resources a security suite might need, and 360 Total Security grabbed more than we were expecting. The program code hogged a mammoth 1.48GB of hard drive space, and it added three background processes requiring around 115-120MB of RAM. That's notably more than most of the competition, though probably not enough to make a measurable difference to most users. We completed our initial checks by browsing 360 Total Security's files to check the developer, confirm they're all digitally signed, the certificates are valid, and more. This can show odd problems with even the biggest antivirus names, but 360 passed every test with ease. 360 Total Security looks and feels much like any other antivirus you've ever used. It adds an icon to your system tray, and left-clicking displays a console with a summary of your security status. A sidebar gives you one-click access to antivirus, the speed-up and clean-up tools, and more. Clicking the Virus Scan button displays three scan types: Quick, Full and a limited Custom scan (you can choose locations on your hard drive, but not whether you want to scan memory, the Registry, removable drives, or other options you might get with more configurable applications). 360 Total Security can use up to five antivirus engines, including Bitdefender, Avira and three of Qihu's own. Bitdefender and Avira aren't enabled by default, unfortunately, and the interface does a poor job of helping you realize that. Instead of a clear text display – 'Bitdefender: on/off' – engine status is represented by five tiny icons at the bottom of the screen, which you might not even notice. Explorer integration was better implemented. Right-clicking a file gives you the option to scan the file (or files), run it in the sandbox, or forcibly delete it, which might be handy if you can't delete a file by the usual means because it's open in something else. We ran some simple tests of our own, with mixed results. The package didn't find all our test malware. It raised some odd false alarms. Information about these alerts didn't always make much sense (we were told that a batch file had an invalid digital signature). Results were particularly poor with the standard Qihu engine, but they didn't improve as much as we expected when we turned on the Bitdefender and Avira engines. Scan times were a little slow, and didn't seem to improve significantly over time. Our first quick scan took five minutes, then dropped to around two minutes. Our initial full scan required 63 minutes, and was still taking 56 minutes by scan number three. There's no sign of the optimizations you'll see in other antivirus packages, which might only check files that have been added or changed since the last scan, usually reducing times to a tiny fraction of the original scan length. 360 Total Security only allows one scan at a time, which could be annoying. We set the program to run a lengthy system scan, right-clicked a download and selected ‘Scan with 360’, but were told: "there is an ongoing scan, please try again later." That's not good enough – users should always be able to immediately check anything they're worried about. Run a few tests of your own and you'll spot the program's many ads, which appear in various interface elements, as occasional pop-ups, or when your system boots. They're annoying, but no great surprise for a free package. You can dismiss most of them with a click, or remove them entirely by upgrading. Bonus security features start with the sandbox. This allows you to run dubious programs in an isolated environment where they can't affect your system. We tried a few applications and most of them didn't run properly, but our tests were only limited and it's possible you'll have more luck. Document Protector backs up documents when they are created or changed, theoretically allowing you to recover from ransomware infections or other data disasters. The system lacks even the most basic configuration options (document types to protect, folders to watch), but it does work at a simple level, and might be handy for some users. A Patch Up tool can detect and install patches for Windows, Office and a few other apps. It also seems to work correctly, but we struggled to see why you would trust this ahead of Windows Update. A VPN button downloads and installs a SurfEasy package. The baseline free edition only gives you a horribly limited 500MB a month, but there are a reasonable 16 locations available, and speeds were good at 55-60Mbps for UK to UK connections. The service could be handy for very occasional use, but there might be better options available. The free Opera VPN is also powered by SurfEasy, and it has no bandwidth limits at all. A webcam protection module aims to warn you if unrecognized programs (or any apps) try to access your webcam. Sounds good in theory, but our test command line tool was able to take a webcam snapshot without raising any alerts. The Speed-up module scanned our test system and made 68 recommendations about our startup programs, scheduled tasks, services and network settings. Again, this sounds good in theory, but in practice? Not so much. The program doesn't always tell you much about what it has found. One of our startup items had the description: "Malware; adware was installed as a bundled software." We wanted to know what this was, and to see a path, and/or a filename, but there were no more details – no other way to see what 360 Total Security wanted to remove. The recommendations were sometimes questionable, too. Our system included 12 items relating to software updates, including Windows Update, and 360 Total Security labelled them all as either ‘recommend off’ or ‘optional off’. Why would a security program which tries to help you download updates for some applications, recommend you turn off updates for others? The Clean-up module did better, scanning our system for leftover files including Windows and application-related junk, browsing histories and unwanted browser plugins. It found 4.7GB on our test system, while CCleaner could only locate 2.5GB. That seems impressive, but again 360 Total Security falls down on the information it provides. We were told it could free up 952.4MB from the Windows Installer Temporary Cache, for instance, but which files would this delete? CCleaner allows you to see exactly what it's going to wipe. 360 Total Security just leaves you to guess, making it difficult to judge how trustworthy its recommendations are. Browsing the menus reveals a few other small tools, but most are underpowered. An Instant Setup module allows you to select and install popular software with a click, for instance. That could be interesting, but right now it only supports a mere 16 applications (Opera, but not Chrome or Firefox), and you can't manage apps once they're installed. You'd be better off with Ninite.com: it's easier to use, supports more apps and (we suspect) will work correctly on many more systems. 360 Total Security delivered mixed results in our simple malware detection tests, even when we enabled the excellent Bitdefender and Avira engines. Our checks are too small-scale to be definitive, though, so we were interested to see the verdicts of the big testing labs. This proved more difficult than we expected as 360 Total Security isn't commonly tested, but AV-Test's October 2017 Home User report might tell you everything you need to know. AV-Test found that the default engine detected at best 75.3% of the known malware samples. To put that in perspective, the industry average is 98.5%, and the best products detect 100% almost every month. Detection of 0-day malware was much better, but still not good enough. The program blocked 96.8% of threats one month, 91.7% the next; the industry average is 99%, and once again the best products typically block everything. Enabling the Bitdefender and Avira engines made a significant difference, lifting the detection of known malware up to an average of 99.8%. But, oddly, you would still have got better results by buying Bitdefender's own package, which managed 100%. 0-day malware detection was unchanged as it's handled by 360 Total Security's own engine. We found one other detailed test in SE Labs Home Anti-Malware Protection report for July to September 2017. This pitched 10 top antivirus engines against three common attack types, and explained what happened next. 360 Total Security started well, blocking 25 out of 25 of the email threats. But it only stopped 44 out of 50 of the dangerous web downloads, the lowest in this group (four of the test programs blocked everything). The worst result was for exploit-based targeted attacks, where the program stopped just one out of 25. The next worst package, Avira Free Security Suite, blocked 16, and again, the top four packages blocked the full set. We suspect these tests were based on the 360 Total Security native engines alone, without any Bitdefender or Avira assistance. Still, that seems fair enough as it's the default setting, and as exploit protection isn't really about file detection, we suspect it wouldn't have made much difference. 360 Total Security just doesn't deliver the accuracy you need. 360 Total Security doesn't have the accuracy to be your first-line antivirus defense. You could install it as a simple second-opinion scanner, though, or ignore the antivirus side and just explore the bundled tools.